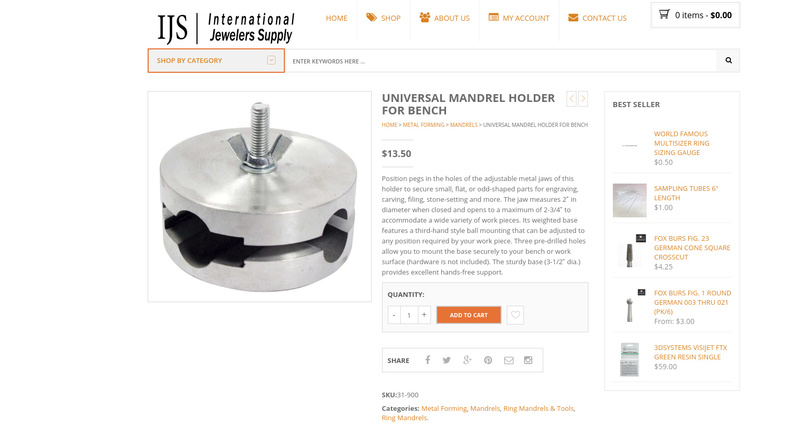 "Which basic ring clamp should YOU use & why?" How often have YOU asked yourself that question? In my newest essay #83, that question will now be discussed. I will answer that simple and yet interesting question showing you 5 different ring clamps & 20+ photographs. I’m very sure once you read this informative essay, you’ll have a better understanding the ‘pro’s & con’s’ of each clamp. I’m answering ‘how each can be used & of course where’? I put many “demo-rings” in them, you can see for yourselves just how they seem to answer your first question,"WHICH BASIC RING CLAMP TO USE?" Regards to all and everywhere! Off topic, but can’t figure out how to introduce a new one. My problem is in trying to create the setting for a faceted stone, where you create an arc of metal, solder it into a tapered tube, cut out prongs, etc. I have 2 stone setting books with detailed instructions but can’t seem to come out with the right size tube. Don’t know whether there are typos in the directions or I just keep reading them wrong. Regarding the question I asked about the cone setting for a faceted stone, after many trials and errors I seem to be getting the idea. At least the paper attempts were cheap and disposable. Now to try it in copper. 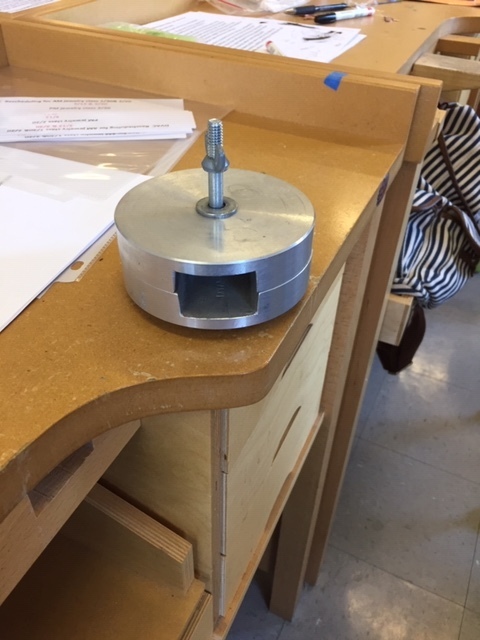 This tool was donated to our class, but no one knows what it is. Can you help? That is a mandrel holder. I have one, and the openings fit the tang on bracelet mandrels and ring mandrels. Slide them in and tighten the wing nut. It does have to be bolted to the bench top. That looks to be an old communications device mount for a wheelchair. The round areas would clamp to the tube on a wheelchair probably 7/8" but could be a 3/4" mount. Another component would slip into the square area and a small computer or lap top would be mounted to that part. It is probably Canadian or a one off from a rare American clinic with imagination. I used to see these come through my shop in my previous life as a communications tech working with the disabled population. Thanks for the ID on the mandrel holder. One more question, is there some way to bolt it to the table, it doesn’t seem to have any extensions, etc. Do you just secure the mandrel tang and then bolt the whole thing down? Note how long the included bolt is, certainly long enough to pass through a bench top. I imagine you’d use the same bolt to both tighten the holder and secure it to the bench via a hole drilled through. My mandrel holder is mounted to a tabletop with a long bolt, the same way Elliott says. I drilled a hole in the table for it. 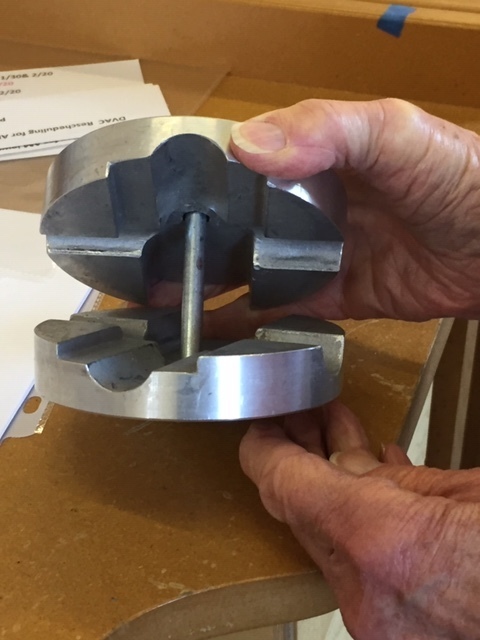 The bolt is threaded through the table, then the holder, then the wing nut is put on. OK. I guess if the school is OK with drilling another hole in one of the tables, we’re good to go. Well I am not surprised it has another, and probably original purpose. Much of the equipment I worked with on wheelchair mods came from other purposes. Some came from the commercial fishing industry while other mounts came directly from drum sets.